Please join the Shared-Use Mobility Center and reception sponsor Lyft for a spooky “Scared Mobility” NACTO reception along the banks of the Chicago River on Halloween night. The reception will take place from 6:00 to 8:00 PM at River Roast, a new restaurant in a unique riverside venue with two bars and an outdoor patio. Don’t miss this chance to network with leading experts from cities, transit agencies, and the shared mobility industry while enjoying dramatic city and water views on River Roast’s outdoor patio. 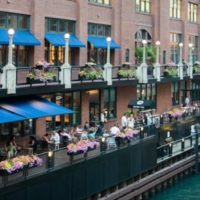 River Roast is located just north of the Chicago River in the Loop, an easy walk along the Chicago Riverwalk from the Swissôtel conference venue. Spots are limited, so be sure to RSVP!